It's not uncommon for a group of us beer geeks to get together, try a few different brews and discuss them along with a billion other things beer geeks will discuss. It's not unusual for the conversation to turn to the topic of barley wines and especially barley wines we have tried before and want to try again if we ever spot them on a beer hunting adventure. 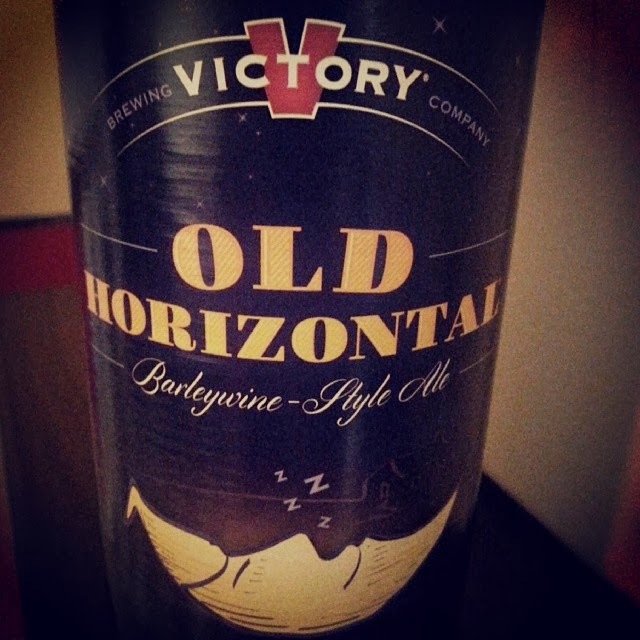 The one that our group seems to have talked the most has been Victory Brewing Company's Old Horizontal. It had been a good few years since it has been seen on the shelves around these parts. From what we have gathered though-that was the case all around the nation as it was on a two year hiatus til it started appearing again late last year. The times I had tried it before I was always a delight but I never got around to making any notes about it. This time around I have. Pouring a clear burnt orange color a large, bubbly two finger tan head appears before slowly melting down and leaving rings of lace behind. The scents of fresh baked raisin bread, caramel apples and grapefruit introduce themselves almost immediately from a light whiff before they begin to intermingle with each other culminating into a sweet aromatic blend. Lots of buttery toffee and caramel and a very silky texture in the mouthfeel comes out in the front on the first sip. They hold strong for a moment then give way to rye toast and orange marmalade flavors in the middle followed quickly by blend of dates, blueberries and black currants along with the first initial hints of warmth from the +11% abv. Towards the end the hop characteristics come out adding a pine bite that does not push out the perfect blend of all the flavors that proceed it but adds and compliments them. The finish closes with a bit of a white pepper linger along with citus peel tang and hint of hazelnuts and dark chocolate. When I first spotted these around this year I bought two bottles with the intention of putting on in the cellar and one to drink. I didn't want to go all crazy and buy up every bottle because that hoarding mentality kinda pisses me off (unless they intend on sharing) and wanted to make sure that others around town who may be interested in trying it would get a chance to to grab a bottle or two for themselves. In the past they were here and gone within a couple of weeks. Luckily a few stores around these parts got enough so the bare spot on the shelf where they once were has not happened yet so I have been able to reward myself every couple of weeks with one as well as stick a few away to see how they age. One of my most favorite barley wines ever!